The seven diptychs (Acc.nos. 289.2007.1 - 289.2007.7) belong to the series "Genji goshû yojô" ('Romantic reminiscences of Genji') consisting of 54 diptychs in the ôban format. The series was published from about the end of 1857 until the 6th month of 1861, or even later, but not in a numerical order. Each diptych presents a full-length figure clad in gorgeously decorated robes standing or sitting against a white background with sprinkled gold and silver dust. The motifs are faithful reproductions in colour of the black-and-white illustrations of the novel "Nise Murasaki Inaka Genji", written by Ryûtei Tanehiko and illustrated by Kunisada. 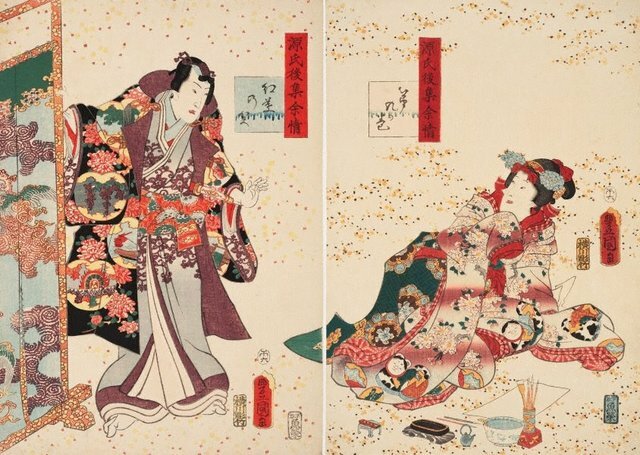 Due to the enormous popularity of Tanehiko's new version of the classic novel "Tale of Genji", single print series were produced in large numbers in order to satisfy the demand of the growing audience. "Genji goshû yojô" is a particularly luxurious edition, as each chapter of the tale is represented on a diptych and various complex printing techniques such as blind printing, printing with gold and silver, as well as brilliant colour are applied. Each diptych shows the same composition with the title of the series written in a narrow vertical cartouche in the upper left corner while the numeration of the chapter is written in a square cartouche on the right print and the chapter’s name on the left print. A male and a female figure is shown on each print, their poses are juxtaposed to each other. Great imagination and care are applied to the textile pattern as well as the lavishly decorated accessories and furniture. “Genji pictures” ('Genji-e') became very fashionable after the publication of Ryûtei Tanehiko’s novel “Nise Murasaki Inaka Genji” (published as a series between 1828 to 1842), a parody of the classical version by the court lady Murasaki Shikibu from the 11th century. The craze for Genji pictures increased further after Ryûtei’s novel had been adapted for the Kabuki theatre in 1851.